Hemmersphere: Jolly Ol' St. Nicholas? Not if you deny the divinity of Jesus. Then St. Nick is less than jolly. 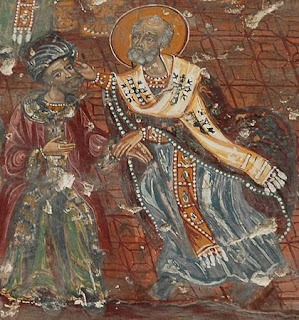 According to tradition, at the Council of Nicea, Nicholas, then Bishop of Myra, dealt with the heretic Arius by crossing the room and striking him in the face. Nicholas was temporarily deposed as Bishop and jailed until the rest of the Council decided that sometimes heretics are best dealt with with a good, old-fashioned punch in the face. No, you're not free to believe about Jesus whatever you want, not if you value your salvation or your pretty-boy complexion. I feel a lyric writing competition coming on. Pick your favorite Christmas carol tune and write words for the patron saint of bare-knuckle boxing. I'm a husband, a father, part-time farmer, do-it-yourselfer, and Lutheran pastor.